I’ve been making a concerted effort with my special education colleague/co-teacher to spend more time helping our students make contextual connections to our vocabulary acquisition system. We have a lot of language-based disabilities and a handful of ELL students this year that need more support than ever. I’ve begun using Word Walls, for example, and we have been integrating the various words into games and activities. 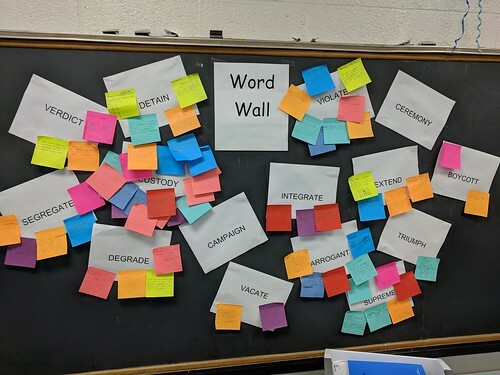 This image shows our Word Wall with sticky notes in which students had to connect the words to the novels we are reading (Flush and Watsons Go to Birmingham) in context. They had to write a sentence about a character or scene, using one of our words from this week’s vocabulary unit. This was easier for the Watsons group than for the Flush group, since the them of the words were Civil Rights. But all students in all the classes found a way to success. I’ve used Word Walls, but not with any real dedication through the year, so I am trying to keep it going and aim to be using the wall as a place for review and learning. Plus, you can’t go wrong with colorful sticky notes and 11 year students.